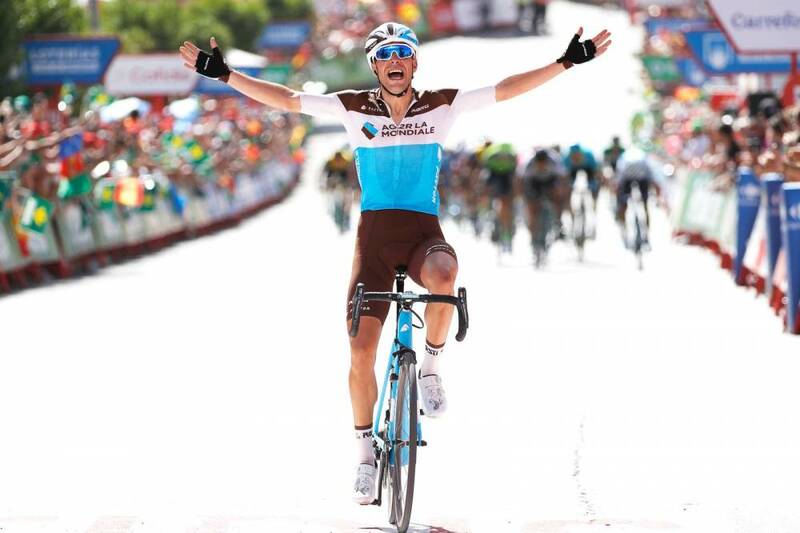 Tony Gallopin (AG2R La Mondiale) claimed stage 7 of the Vuelta a Espana, after the French attacked from the lead group during the final 3 kilometers to seize a solo victory ahead of Peter Sagan (Bora-Hansgrohe) who in turn out-sprinted Alejandro Valverde (Movistar) to trap the second spot on the podium. Meanwhile, Rudy Molard (Groupama-FDJ) extended his race lead after Michal Kwiatkowski (Team Sky) lost time following a crash during the last kilometers, wherein the Polish rider fell along a descent and was forced to fight his way back in order limit his losses. As a result, Valverde moved up into second place, after taking bonus point in today’s sprint finish. Gallopin made light work of a headwind to surge clear of a hesitant main pack and catch and pass Jesus Herrada (Cofidis) with two kilometers remaining before holding on for a maiden stage win in the Vuelta at Pozo Alcon. In the meantime, Sagan pipped Valverde during the uphill sprint for second, while Eduard Prades (Euskadi-Murias) and Omar Fraile (Astana) completing the top five in a thrilling finale. 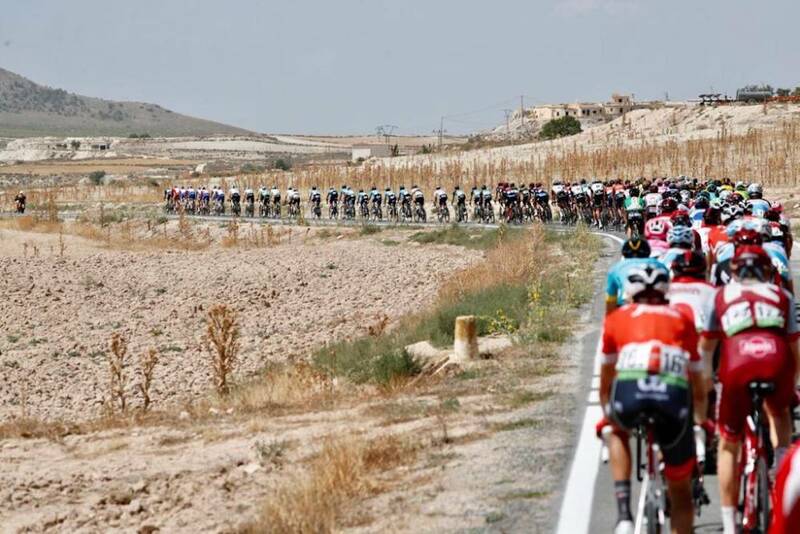 Just 28 riders came to the line in a chasing pack behind Gallopin after a series of spills and race incidents split the peloton into numerous groups during a lumpy closing 20 kilometers over narrow, sinuous and coarse roads in the Murcian hills. Molard came home safely in that elite group to retain the red leader’s jersey but his nearest rival is now the Spanish veteran Valverde after Kwiatkowski hit the deck while leading the chase through a left-hand bend on a descent with 8 kilometers remaining. Kwiatkowski ultimately battled his way back to rejoin his GC rivals but came home in a small group of riders 30 seconds in arrears, causing the Team Sky rider to drop from second place to sixth on GC, at 1:06 behind Molard. A group of seven riders containing Alexis Gougeard (AG2R-La Mondiale), Michael Woods (Education First-Drapac), Floris De Tier (LottoNL-Jumbo), Nicola Conci (Trek-Segafredo), Edward Ravasi (UAE Team Emirates), Alex Aranburu (Caja Rural-Seguros RGA) and Oscar Rodriguez (Euskadi-Murias) succeeded in riding clear from the outset of today’s 182 kilometer stage from Puerto Lumbreras to Pozo Alcón. Despite an early crash and two bike changes, Woods managed to fight back into the break as the escapees built up a maximum lead of three and a half minutes, while De Tier took the points over the Category 3 climb of the Alto Collado de Laude with around 65 kilometers remaining. With 48 kilometers remaining the pack zipped through the finish area at Pozo Alcón in the opposite direction than that which would take them to the actual finish – enjoying a sweeping descent which, an hour or so later, would turn into a 7% ramp to the line. Ahead of the decisive final 25 kilometer the gap dropped to one minute as the teams of the main favorites, most notably the LottoNL-Jumbo’s Sam Bennett, jostled for positions ahead of the second categorized climb. However, as the road narrowed into a bottleneck, a touch of wheels knocked riders over like dominoes, disrupting the chase after Woods had ridden clear of De Tier in the break, claiming Tiesj Benoot (Lotto Soudal) amongst the casualties. After an initial slowing in the chase, the peloton swept up the entire break – with Woods the last man standing, caught just moments ahead of the summit of the Cat.3 Alto de Ceal. Spaniard Llius Mas (Caja-Rural) rode clear on a plateau following the climb – and once again the chase was reticent following a crash involving Quintana with 11km remaining. The Colombian was one of a cluster of riders who hit the deck or suffered untimely punctures, most notably Dan Martin (UAE Team Emirates) who would eventually lose four minutes. Ending their truce on the double-digit ramp to the intermediate sprint, Bennett and Simon Yates piled on the pressure in a nervous pack once Quintana fought back into the field. But it was Kwiatkowski who led the chase on Mas as the strung-out peloton zipped down the dusty descent, only for three Sky riders to skid off the road on a bend. Chaos and confusion ensued as the pack split into numerous groups and Herrada rode clear. A six-man chase group formed featuring Quintana, Bennett, Lopez, Ion Izagirre (Bahrain Merida) and Kwiatkowski’s Sky team-mate Tao Geoghegan Hart. When this move came to nothing, Gallopin threw the dice with a devastating effect, as the French rider zipped past a tired Herrada and took advantage of the indecision behind. Gallopin still had the rise to the line to negotiate, but he built up the requisite cushion to allow him to sit up and savor his first Grand Tour stage win since 2014. 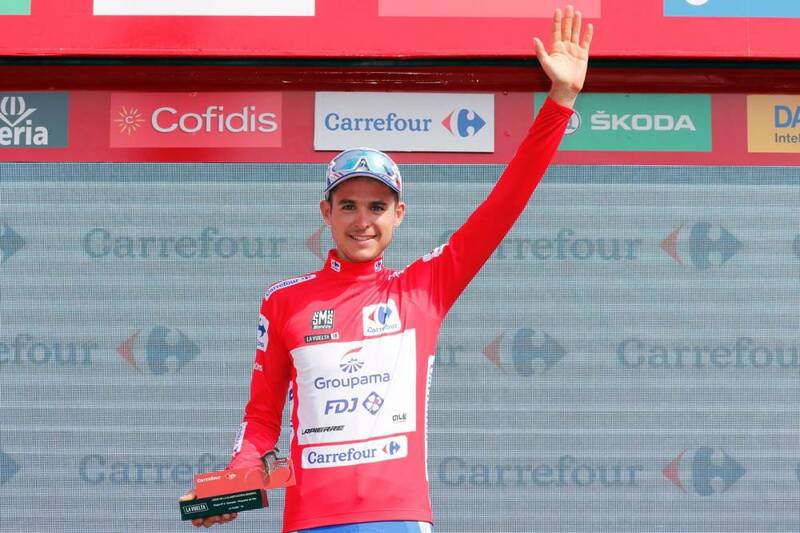 “We had a plan and the team put me in a really good position to fight for the best,” said Gallopin. “I found the right moment to attack and I’m super happy”, he added. Sagan and Valverde would have been kicking themselves when their duel to the line was not for the win but for bragging rights as runner-up, with the world champion putting in a reminder of his returning form by taking the spoils. Meanwhile, the clocks were ticking away for Kwiatkowski, the big casualty of the day, who limited his losses to just 25 seconds on his rivals, but dropped from the top five despite his best efforts.